No matter where you go, the language that binds the whole world together is the language of music. Music transcends boundaries like no other, and one such instrument that will help you take a musical journey is the guitar. This is one instrument that has slowly and steadily risen to the higher echelons of the musical world with popularity increasing every day. There are budding talents all around the world trying to play it, some succeeding while some are not as lucky. It is here that you get to see the best of the musical world with the trials and tribulations and the ecstasy of success. While there is a lot of demand for guitars, it is a big question as to which type of guitar is suitable for you. Amidst the loads of options that may confuse you, if you want to learn guitar from the core, then there is none better than the acoustic guitar. 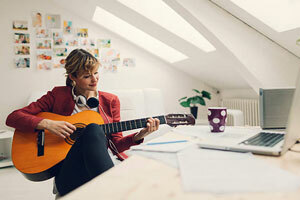 This is the basic guitar for beginners, but if you learn it correctly, then you might as well be the master of the instrument and may play a different type of guitars with ease. The most important part of any guitar is the string. It is the heart and soul of it as this is the part of the instrument which will allow you to make beautiful music, something that you want. 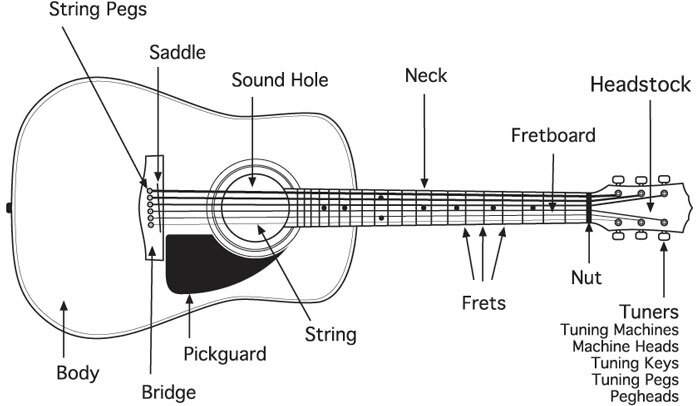 Different guitars have different numbers of strings. There usually are six strings on an average. The body of the guitar is the base of operations; it is more like the brain of the instrument. It is the part that has the responsibility of keeping all the other parts of the guitar together. Made out of wood, guitars do vary in shape and size and body has a very meticulous job of adding style to the guitar. It is here that you will find the strings are attached to the body of the guitar. The way they are connected will define how long you can hold the note as well as the aesthetics which plays a pivotal role in maintaining the quality of the sound. This is the place where you actually get to have fun with the guitar. It is here that you will find the fretboard, the nut, and the tuner. The design of the neck plays an essential part in the overall playability of the guitar. The head is where you will find all the tuners of the guitar. Here the design of the head will decide the arrangement of the tuners. For instance, you might see the tuners being aligned in a straight line or see them protruding out of the side of the head. Now that you know the acoustic guitar a little better, you are ready to take the next step, which is to learn how to play it. To play this guitar correctly, you will need to be good friends with the strings. You cannot play the guitar if you don’t know how to manipulate the strings to get the sound that you want. For instance, you need to know when to press the string and when to pull or release it. Make sure that when you are pushing the line down, it must hit the fret and practice this part a lot. And one tip to make you musically sound: while you practice this step, play the string that you are pressing at different frets to know the sounds that each of them produces. The sustenance of the notes is something that will come in handy in the long run, but start playing from an early stage. How long you should hold the note and other essential elements only come by practice. All you can do here is try to pluck the notes or pick up on a particular song and then listen to it carefully and try to get the timing by yourself. If you want to get good at playing the acoustic guitar, then you have to get the chords right. You have to know which chords to use and when. Moreover, good knowledge of the scales is essential as well because they are directly proportional to the chords of the guitars. You will need some notes which might help you know the various kinds of music of the guitar, something that you can read up.